Glassware marked Daum Nancy is credited to Auguste and Antonin Daum. These brothers took over a glass factory owned by their father Jean Daum located in Nancy, France during the 1870s. The Daum factory produced watch crystals and utilitarian glassware until the 1890s. The brothers began experimenting with art glass beginning in the 1890s and continued into the early 20th century. 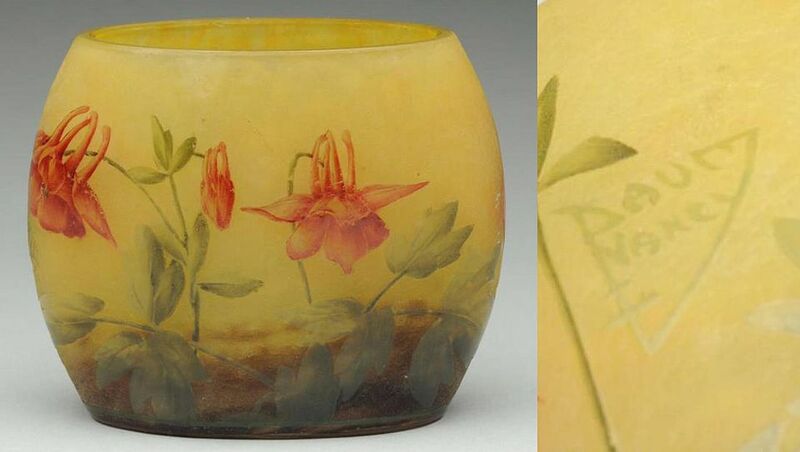 They introduced their cameo glasswares at the Chicago World’s Fair in 1893. Much of the glass made by the Daum factory was cameo in style. That is, multiple layers of glass carved to achieve a design in low relief. Some examples combine a variety of techniques, however, such as enameling or intaglio carving in the design rather than adhering strictly to cameo décor. Occasionally, a Daum piece will be found set in silver or gilt base to form a vase or dish. The Daum brothers are said to have been greatly influenced by their neighbor Emile Gallé, according to European Art Glass by Ray and Lee Grover. Some of their work, in fact, may be confused with Gallé’s glass at first glance, since he indeed mastered the cameo technique. Daum’s glass became even more popular and innovative after 1904 when Gallé passed away, as reported in a CollectorsWeekly.com online article. After a slow period of art glass production during World War I, the factory turned from Art Nouveau to Art Deco designs keeping pace with more popular styles of the day. Daum also shifted from handcrafted wares to more mass produced pieces. Pâte-de-verre, a process where crushed glass is placed in a mold and heated until fused then finished using cameo glass techniques, was also widely used, according to Collector’s Weekly. When World War II ended, Daum changed its focus again. Clear lead crystal was blown or hot-worked by artisans into beautiful figures, bowls, and other wares. They were influenced by the Daum Christalerie de Nancy work of the 1920s. Pâte-de-verre pieces were reintroduced by the company in the 1970s as Pâte-de-Verre Nouveau. More recent Daum Nancy pieces are still made of high-quality clear glass. Some Daum Nancy pieces are marked by incising the signature into the side of the piece, as is the case with the pillow vase illustrating this article (see above). Other Daum marks are found on the base of the piece. Whether on the side or bottom, the mark will include the words “Daum Nancy” with the Cross of Lorraine (a French cross consisting of a vertical line crossed by two horizontal bars with one being shorter than the other). Some marks connect the cross with the signature, others have the cross beneath the Daum Nancy wording. There are a number of different variations on the Daum Nancy mark as well. Some have the “Y” in Nancy elongated in what collectors reference as the “Devil’s Tail” mark (as shown in the photo above). Others include the word “France.” One variation includes the date and a butterfly, and several have very curvy writing. Daum marks without the cross of Lorraine indicate pieces that were manufactured by Paul Daum, one of Auguste Daum’s sons, who also owned several glass factories. These businesses were managed by former Lalique employee Pierre D’Avesn. The glass made by this firm is also high quality and considered collectible. While avid Daum Nancy collectors can usually spot the fakes rather easily, novice glass buyers may find a piece and acquire it thinking it is an original. These pieces are usually marked with a very thick “Devil’s Tail” style signature (in comparison to the authentic signature above). Most of these pieces, however, differ from the originals they somewhat mimic in one or more ways. For instance, the execution of the décor is not up to par, or the glass is not finely finished like pieces truly made by this factory. Once you become familiar with the quality of Daum Nancy originals, it is very easy to distinguish the fakes. Until then, buyer beware.